Jacob Johns is an artist, hairstylist and prominent Native American activist. Jacob Johns has lived multiple lives, many of them wrung to the last drop of bitter and sweet, sometimes in equal measure. As an artist, musician, DJ and hairdresser, he's also an activist, passionate about Native American issues and environmental concerns. "I don't have to be confined to one thing," says Johns, who is of the Hopi and Akimel O'odham nations. In addition to Sierra Club rallies and protests against oil and coal train traffic, Johns has made several supply runs to the Standing Rock Sioux camp since September, where he joined Dakota Access Pipeline protesters and was interviewed by Democracy Now's Amy Goodman, documenting his scuffle with guards who had unleashed dogs on the protesters. Amidst that ugliness, Johns still found beauty. "Being in that area was such solidarity, such clarity. Everyone was taking care of each other," he says. This 32-year-old father has learned to find purpose in chaos. Upon relocating to Spokane in 2010 from Arizona, where he served a sentence for assault after a rough patch following his brother's suicide, Johns created Studio 111, originally as a haircutting business. The numbers 111, explains Johns, relate to a dream he had during his time behind bars, and a subsequent conversation with his mother. They discussed Johns' vision of a little black book — the Bible — and the passage of Isaiah 11:1, which states, "A shoot will come up from the stump of Jesse; from his roots a Branch will bear fruit." As he did for his haircutting clients — he views altering hair and the body as sacred acts — Johns recognized he could transform himself, not in spite of his pain, but through it. He wanted to help others fill the hole that suicide and other trauma causes, says Johns, because otherwise "people will fill it with drugs and alcohol or some other addiction." 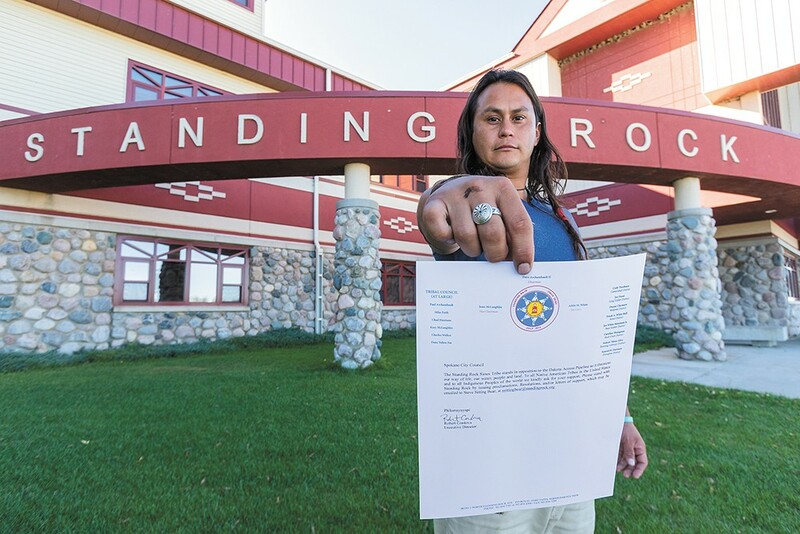 Johns in front of the Standing Rock Sioux Tribe building in North Dakota with a letter from the tribe asking the Spokane City Council to pass a resolution against the DAPL. Fully enmeshed in the regional Native American cultural landscape, Johns advocates healing by reconnecting with traditional tribal culture, and is particularly interested in inspiring youth through written and oral language and art. Using spray paint, pencil, marker, acrylic and other two-dimensional media, Johns creates works that often combine facial portraits and sacred geometry with gestural expressions of color and graffiti-like stylings. He often donates his time, work or both, such as designing the logo for the recent One Heart Native Arts and Film Festival and participating in auctions benefiting such organizations as Spokane's American Indian Community Center. In addition to hairdressing and art, music is part of Johns' path. 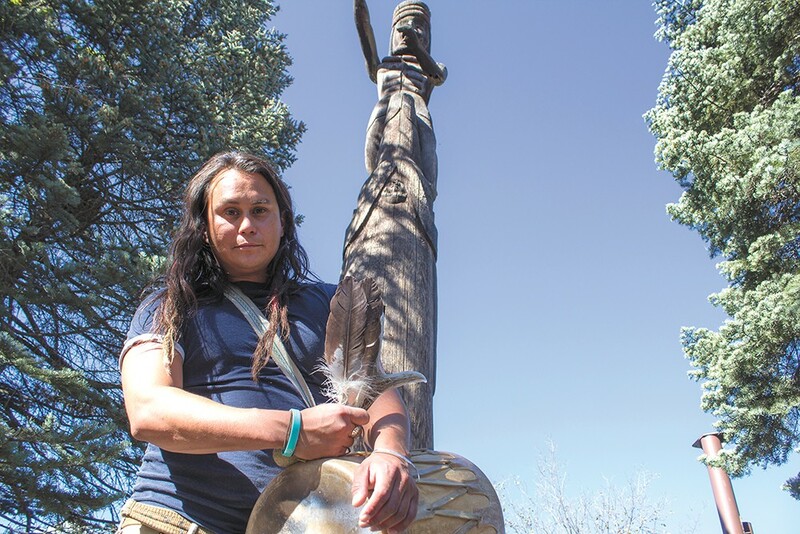 He created a CD of original Hopi music, Unity Consciousness, with songs like "Spirit Calling" and "Morning," and frequently brings his drum to events, such as a recent Spokane gathering in support of the Dakota Access Pipeline protesters. Sometimes Johns combines art and music, such as his live painting at the inaugural "We Are Still Here" exhibition last year at Hatch: Creative Business Incubator in Spokane Valley. He says he may do a similar performance painting at this year's exhibition, which he's coordinating with Spokane tribal member Jeff Ferguson. "It feeds a part of my soul," says Johns. So does activism, says Johns, who remembers the 1992 standoffs with federal authorities raiding Arizona casinos over video gaming machines. Johns serves on the United Native Americans of Spokane Public Development Authority and works with the Alliance for Gun Responsibility, which is backing Initiative 1491 in this election cycle. Efforts to recognize the contributions of American Indians and Native Alaskans date back 100 years among individual states, government entities, Native Americans, even the Boy Scouts. Assorted presidential proclamations and Congressional resolutions have set aside as little as a day and as much as a month to recognize native culture, until 1990, when former President George H.W. Bush designated November as Native American Indian Heritage Month. • "For Our Roots and Our Seeds" is an all-ages open-mic and music benefit for the Standing Rock community, Saturday, Nov. 5, from 7-9 pm at Saranac Community Building. community-building.org.